There has been some comment on the fact that, with recent increases in spending on the NHS, the health budget is taking a growing proportion of UK state spending. I am missing Flip Chart Fairy Tales, so here is a chart heavy post to make one or two obvious points that regrettably are often missing from political reporting. The first is that health has been taking up a growing slice of our total expenditure (i.e.GDP: expenditure on everything including investment) for a very long time. Here is a chart from a recent IFS publicationwhich is a good source for more in depth analysis. 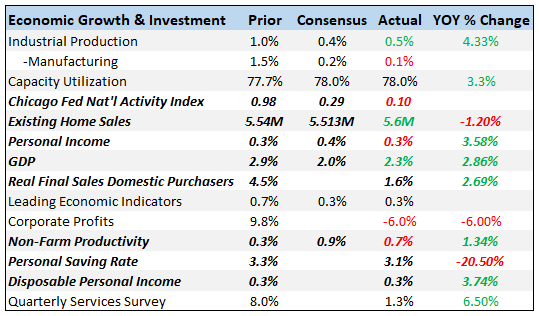 Note that real spending numbers can be misleading: although real spending has increased since 2010, as a share of GDP it has not, which is a reversal of previous trends. That alone does not inevitably explain recent problems in the NHS, but it certainly could do. So why is it only recently that the growing share of public spending has been so obvious? Again the IFS have a handy chart that goes a long way to providing the answer. In 1955/6, defence spending was over 20% of total spending, while by 2015/6 it had fallen to just 5%. This peace dividend (actually two: first a retreat from empire and then the end of the cold war) masked a steady rise in heath, which was only 7.5% of total spending in 1955/6 but was approaching 20% by 2015/6. Many economists would simply describe this as reflecting that health was a luxury good, which means that spending as a share of income rises when income rises. Not all the evidence confirms this, e.g. the spending patternsof lottery winners. In reality I think there are various things going on. One may be that medical science has got better at prolonging life faster than it has held back the aging process. Another is that medical innovation is increasing the scope of what medicine can do. For example cancer is now increasingly survivable, but only with expensive care. While there is productivity growth in the NHS, it is below the national average and therefore fails to match increases in wages. In the document all the figures so far come from, the IFS expect these factors will require real health spending to increase by 3.3% each year over the next fifteen years. 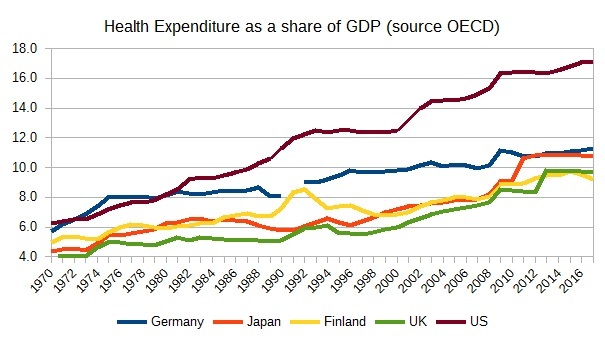 In 1970 health spending was between 4-6% of GDP in these 5 countries, but by 2016 it was between 9-16% of GDP. (There is a definitional break in the UK series in 2013: there was no leap of spending in 2013 as earlier graphs show.) If there is any organisational lesson here, it is not to run a health service in the way they do in the US. It is indicative of the mess the world is currently in that politicians are busy trying to dismantle the positive recent reforms in the US and key politicians in the UK have once talked about making the UK health system more US like. If the IFS is right, this inevitably meansthat taxes of some kind will have to rise significantly. Yet the Conservatives have repeatedly pledged not to raise any of the headline taxes, and Labour have felt compelled to match these pledges at least in part. That the budget included increases in the tax thresholds, and Labour’s internal spat over whether to vote for them, illustrates nothing has changed in this respect. This year this tax/spend dilemma was avoided by a tax windfall no one had forecast. But at some point in the near future something will have to give, and I really hope it is not once again the quality of our health services.